Becuase this wonderful southern style Kentucky Butter Cake's texture is more like a pound cake then a regular butter cake, I placed the recipe under the Pound Cake recipe category. You will love this cake. A must try!! Preheat oven to 325°F (160 C). Generously grease and lightly flour a 12-cup bundt pan or 10-inch tube pan. In large bowl, combine all cake ingredients at low speed until moistened; beat 3 minutes at medium speed. Pour batter into prepared pan. Bake for 55 to 60 minutes, until tests done. Do not remove from pan. In small saucepan, combine all sauce ingredients; cook over low heat until butter melts, stirring occasionally. Do not boil. Using long-tined fork, pierce hot cake in pan 10 - 12 times. Slowly pour hot sauce over cake. Remove cake from pan immediately after sauce has been absorbed, 5 - 10 minutes. Cool completely. Just before serving, sprinkle lightly with powdered sugar. Serve with sweetened whipped cream. 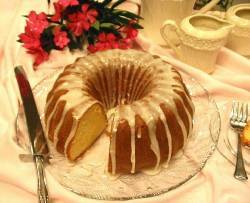 If desired, save a little of the butter sauce and drizzle over cake before serving. Serve on a pretty cake plate and garnish with frosted grapes, fruit slices or fresh flowers. This is one of the families favorites. Though I used olive oil in place of the oil required but the results were great. The cake is very soft and tastes great. Thank you. This is a hit everytime I make it. The family and co workers request this cake at all times. I tend to add extra rum, yummy!!!! !